Betsy DeVos, the white woman who was given everything in life, including her appointment as education secretary, thanks in part to large donations of her husband’s money, is curtailing investigations into civil rights violations because the Trump administration doesn’t care about nonwhite-people issues (Kanye before Kim voice). 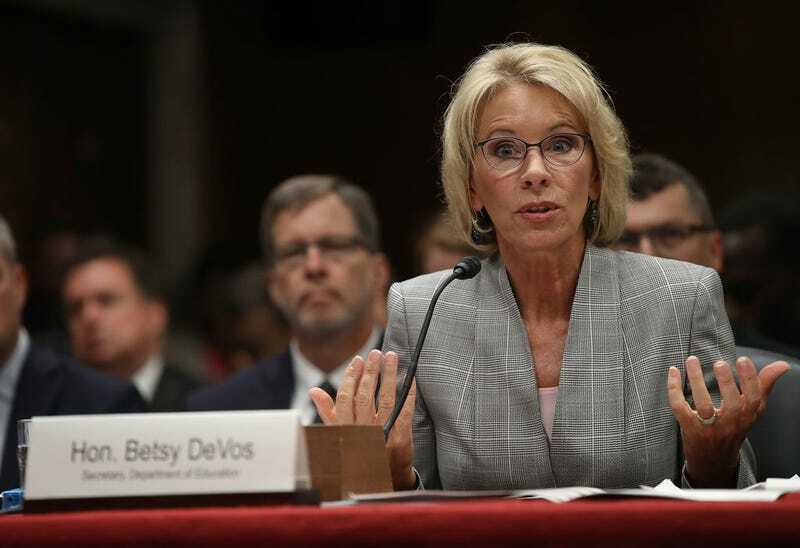 As yet another part of the president’s plan to undo all of former President Barack Obama’s legislation, the Department of Education will scale back efforts to look at systemic issues and whole classes of victims. “Also, regional offices will no longer be required to alert department officials in Washington of all highly sensitive complaints on issues such as the disproportionate disciplining of minority students and the mishandling of sexual assaults on college campuses,” the New York Times reports. This is Betsy DeVos, aka the Sarah Palin of education, in an ongoing attempt to reshape the Education Department. So far, under her guidance, it has suspended legislation that would allow student loans amassed at predatory-lending colleges to be forgiven, and now she doesn’t want systemic civil rights issues to be reported. Nice. The Trump administration claims that because the current legislation caused soaring complaints, the department’s Civil Rights Office found itself understaffed and drowning in paperwork. So instead of increasing staff or trimming her security detail, which has cost taxpayers some $8 million so far, DeVos decided that the department needn’t be bothered with that civil rights stuff. Too messy. Raise your hand if you are shocked at the moves this administration continues to make toward big business and away from the people. Is anyone surprised that DeVos doesn’t care much for civil rights complaints? Seriously, anyone? Senior Editor @ The Root, boxes outside my weight class, when they go low, you go lower. Recent from Stephen A. Crockett Jr.